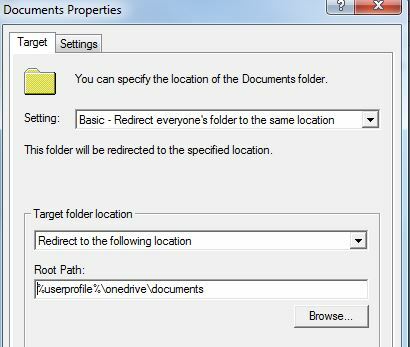 As you already understood from the subject, I’m going to show you how to configure OneDriver service as folder redirection. Before we initiate our task, make sure your machines are up to date and verify there is no an old GPO or any anti-virus software that can block us from continuing. 1TB is quite a big usage which not really uses by users, we can consider redirecting users data to OneDrive, I know that there are many organizations that already have implemented this and haven’t complained about some issues besides Microsoft common restrictions, some people likes to define this method as “Backup” what I can’t confirm that because it is not backup… from my point of view putting users data on ONEDIRVE absolutely reducing file server space, along with that, we can agree unanimously that ONEDRIVE is available from anywhere, which is amazing, but user’s data is exposure likewise, and the most upsets thing is that we don’t have full control on ONEDRIVE management besides GPO settings that we can apply. But yes, I would take this for long POC, at least 10-20 users, for a month and then gather information from them and decided with my IT colleagues what are the consequences of this project, let carry on. If you need to move a data manually to one drive for making a tidy you can use in Robocoby tool which also comes with GUI edition. Don’t change the default location of sync location. under User Configuration\Policies\Administrative Templates\OneDrive, double-click Prevent users from changing the location of their OneDrive folder. Select the Enabled option, and then click OK.
Go to common tab then tick Item-level targeting check box, and then click Targeting. How to Deal with Ransomware? This logonscript for your clients or RDS/Citrix servers persistently maps a OneDrive for Business or Sharepoint Online library to a driveletter. It’s written in Powershell and automatically maps your account if you have ADFS, or will prompt for credentials if you do not have ADFS.